Physicists from the University of Lille, in collaboration with the University of Ferrara in Italy, have introduced a river into an optical laboratory… They have just observed the rupture of a photon barrier in an optical fibre, a phenomenon directly comparable with the rupture of a dam placed on the bed of a river. We and our colleagues have taken advantage of the analogy between the propagation of waves in rivers and the propagation of light pulses in optical fibres to study in detail the formation of the unfurling wave that immediately follows the break of a dam on a river. And this, comfortably installed in our optical laboratory without risk. Drops of water in an optical fibre? It is more than an analogy: under certain conditions, the equations governing the propagation of these waves are strictly identical for each of these media. It is thus surprising that the behaviour of these two physical systems, a priori completely different, is identical. More precisely, we have shown that the tiny drops of water trapped behind the dam behave like grains of light – the photons – of a laser beam when they propagate in an optical fibre. We point out that this analogy had been used more than ten years ago to study the formation of rogue waves. The situation we have studied is completely different. It is a dam placed on the bed of a river that breaks suddenly (nothing to do with a rogue wave). In order to mimic the rupture of a dam in an optical fibre, French and Italian physicists injected into a fibre a laser beam whose variations in intensity versus time corresponds to the difference in water levels located upstream and downstream of the dam. Breaking of a dam based on numerical simulations on a river/in an optical fibre. To do this, the laser is forced to emit a burst of light in the form of a stair step, the level of the steps corresponding to the luminosity of the laser. A first step, of very low intensity followed by a second of very strong luminous intensity. The levels of light intensity are then similar to the levels of water in the river. It is important to emphasize that in order for the correspondence to be valid it is essential that the transition be extremely rapid between these two steps : usually 20 picoseconds or 20 billionths of a millisecond, which makes these experiments very tricky both for the generation of the signals as for their characterization. High-performance devices are needed to achieve this level of accuracy. 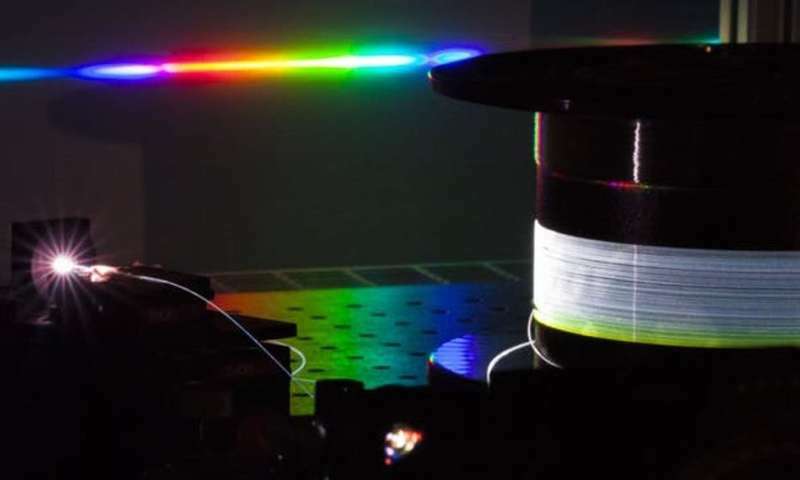 During its propagation in the optical fibre, the temporal appearance of the laser pulse, initially in the step of the staircase, is modified because, on the one hand, new colours are generated and, on the other hand, these colours do not travel at the same speed. The sudden transition between these two steps gradually and inextricably evolves towards a smoother transition. The dam is broken! The unfurling wave leads by the generation of a shock wave and rarefaction wave that connect the two stairs. These two waves provide the transition between the two levels of intensity in the laser frame, or both levels of water in a dam on a river. Let us emphasize, it is important, that the set of experimental observations has been validated by numerical simulations. This confirms that the model used precisely describes the phenomenon and therefore reinforces the strength of the analogy. The main difference lies in the fact that in optics, evolution takes place along the fibre length, whereas in the case of a river, the evolution parameter is the time. 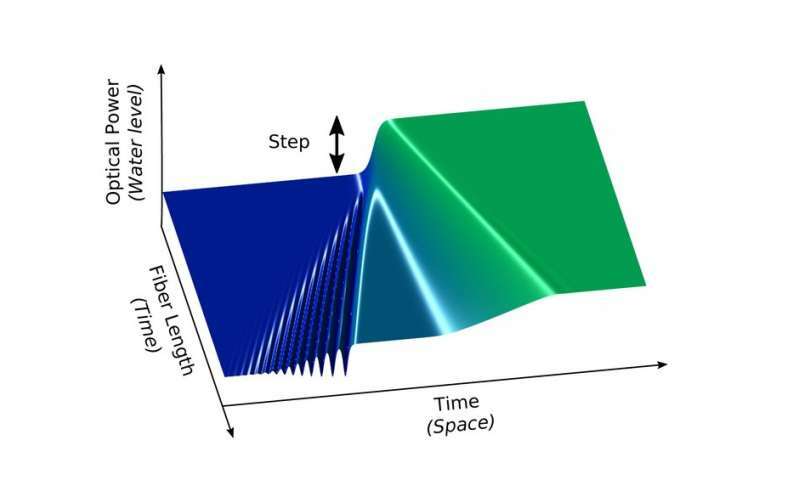 Thus, to follow the formation of the wave following the breaking of a dam, it is necessary to record the temporal shape of the laser for different fibre lengths, as shown in the figure below. Equipment of the Fibretech Lille fibre-optic drawing tower. Unlike breaking a dam on a river, the experiment performed in an optical laboratory is risk-free, repeatable and the set of parameters finely adjusted. 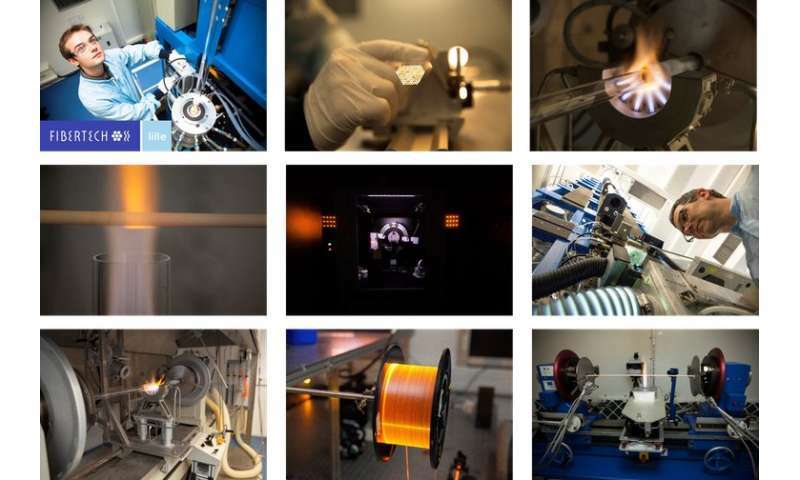 It is indeed very easy to change the power of the laser, its colour or the type of optical fibre. Thus, it is possible to scan a wide range of parameters to achieve a fine understanding of the phenomenon (we used the FibreTech Lille drawing tower of the PHLAM laboratory, based in IRCICA to develop and manufacture optical fibres optimized for this experiment). Because of the formal analogy between these two domains, all the conclusions and interpretations can be transposed to the case of the breaking of a dam on a river. This work constitutes the first experimental validation of predictions based on a celebrated theory developed by the mathematician G.B. Whitham several decades ago and the experimental system implemented will allow us to study a more general problem posed by the famous mathematician Riemann in the nineteenth century. Finally, this work illustrates the approach that physicists follow in everyday life. They develop the most universal models possible to describe and predict what is observed in nature, by collaborating with experts from different countries. The paper was published in the journal Physical Review Letters, titled "Dispersive Dam-Break Flow of a Photon Fluid." A straight rainbow !! Wow ! !